We are excited to announce the opening of our new facility in Ridgeland, WI ! We will see patients in Ridgeland on Monday through Thursday 8:00 AM to 5 PM. We will continue seeing patients 5 days a week in Ladysmith. Check out www.ridgelandveterinaryclinic.... for more information. 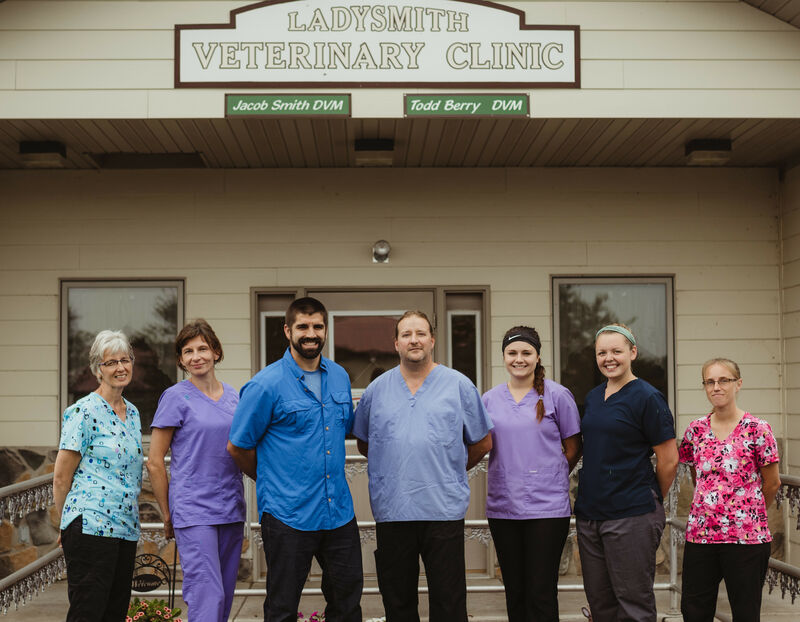 Ladysmith Veterinary Clinic provides full-service small animal and livestock care. We welcome both emergency treatment cases as well as pet patients in need of routine medical, surgical, and dental care. Dr. Jacob Smith and Dr. Todd Berry have years of experience treating serious conditions and offering regular pet wellness care. Beyond first-rate pet care, we make our clinic comfortable, kid-friendly, and calm, so your pet can relax in the waiting room and look forward to meeting our Ladysmith staff. We are happy to offer a number of resources that enable you to learn about how to take better care of your pets. Please feel free to browse our site, particularly the informational articles. The best veterinary care for animals is ongoing nutrition and problem prevention, so becoming knowledgeable about preventative pet care is essential to the ongoing success of your animal’s health. If you have any questions, call (715)-532-5636 or email us and we'll promptly get back to you. Our Ladysmith office is very easy to get to -- just check out the map below! We also welcome you to subscribe to our newsletter, which is created especially for Ladysmith pet owners. At Ladysmith Veterinary Clinic, we treat your pets like the valued family members they are. Originally from Hermantown, MN the Smith family has resided in Northwest Wisconsin since 2013. Dr. Jacob and Breann live in Bruce WI, with their 5 children; Brooklyn, Masyn, Adalyn, Camdyn and Edyn. Our family enjoys athletics, the outdoors and spending time together at our hobby farm. Yulia joined our team in 2016. Originally from Russia, she has broad background in Animal Science and Pet Care. She is currently obtaining her Certification as a Veterinary Technician from Penn Foster. She resides in Ladysmith with her husband Dima, and their children Sergei and Olga. Jessica came to our team in 2015. She is a graduate of Stanley-Boyd High School. She earned her Certification as a Veterinary Technician in 2015 from Globe University. She currently resides in Gilman with her son Christopher, and Cocker Spaniel 'Buddy'. "Overall just a great place! Friendly and caring staff. Dr. Smith is very easy to work with and you can tell he really enjoys what he does." "I wouldn't take my small animals anywhere else in the area. Dr. Smith is great and let's you interact with the care of your pet as you are comfortable with. Great bedside manner and VERY respectful." "Knowledgeable and compassionate...I would not take me pets anywhere else! Dr. Smith and staff are amazing!"